Clean, empty tin cans. I used six standard tuna cans. It helps if you have a few extra tins besides those you’ll be turning into shrines. Wing nuts for feet. I used coarse wing nuts from the hardware store. Mermaids sheet from Ten Two Studios. 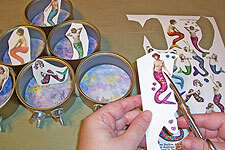 All the merms on this sheet will fit into tin cans. Liquid Nails. This is from the hardware store. It’s a paste-like glue designed to glue metal to metal. Metal tape, or duct tape. 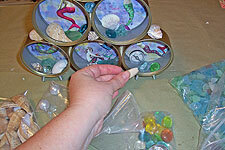 Shells, sea glass, glass marbles, beads, and whatever else you’d like to use to embellish your tree. 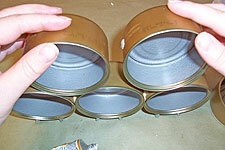 Glue two wing nuts each to the bottoms of three tin cans. I found it easiest to lay a can on its back, and prop one up inside it on its side to do this. 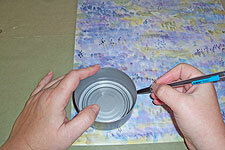 Glue the nuts with Liquid Nails, which is thick enough to keep them from sliding down the side of the can. Position the nuts fairly close together—mine were about an inch or so apart. Let the tins dry overnight. 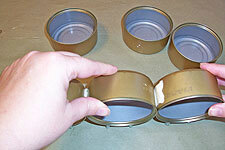 Stand the three footed tins up, and glue them together side to side with Liquid Nails. Let the glue dry completely before handling. While the glue is drying, you can cut backgrounds. 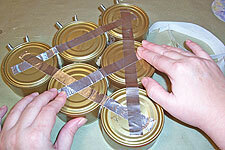 Trace around the base of a tin can six times, and cut the circles out. 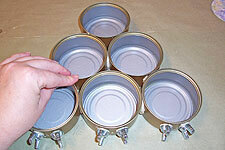 Do a test fit to be sure the circles fit into the tins. Now it’s time to stack and glue a bit. Place two tins on top of the footed three, and make note of where they touch. 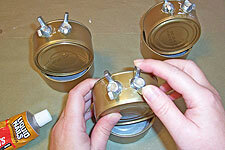 Apply Liquid Nails to the two tins, and press them into place. Do the same with the last remaining tin, positioning it on top of the second layer. Let the glue set, but not dry completely before moving on. I found this helped line the tins up straight and even: before the glue dries, pay the whole tree on its back, and press down against the work table. When the glue is dry, flip the tree over, and apply some metal tape or duct tape to stabilize it. The tree will be very sturdy once the tape is in place. 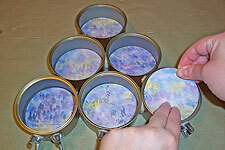 Glue the backgrounds into the tins with E6000. I found this was the one glue that would stick to whatever it was that was lining the interior of the tins. 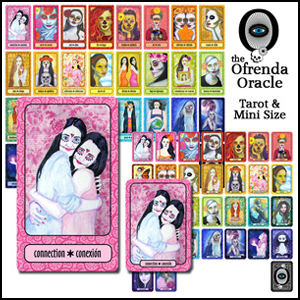 Choose images for each tin, and cut them out. 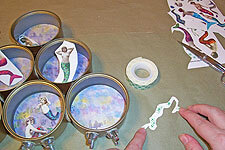 Add double sided foam tape to the back of each mermaid figure, and press them into place in the tins. 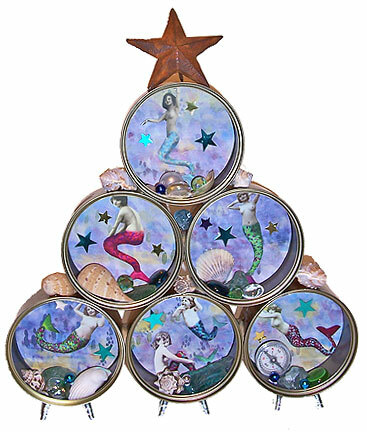 OMG these are adorable – there must be a million themes you can use with the tuna-can-tree base! 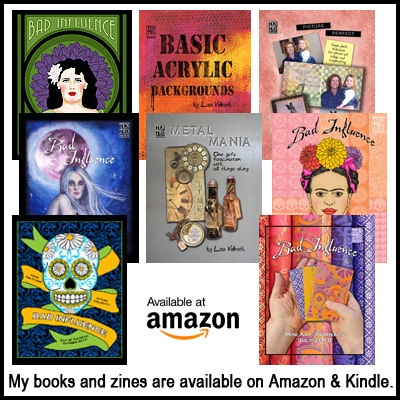 Thank you for the wonderful ideas and really inspiring website. I tried to leave you a “say something nice” comment yesterday but don’t think it worked – I have been all over this website as well as “Lisa was Here” and gomakesomething.com in the last couple of days and am just loving everything I see. Thank you so much for all the work you put into this – for what it’s worth, you have really helped me get excited about Christmas and crafting again! I used some vegetable cans in much the same way, papered the outside with neat scrapbook paper, and glued them in a pyramid form. I use is to hold Sharpies, small pencils, small rulers and glue gun sticks.